“Mmm! Something smells good!” Sara says, as she walks into the apartment after having left for an after-brunch walk with Tabitha and Frank. "I thought you two were already sitting on the couch?" "Wow Sara, you're really on today." "Just a little revenge. They're always like that." "These chips are good! What kind are they?" "Speaking of potato, what kind of potato are we eating with dinner?" "I've got a nice garlic mashed potato recipe going over here. My aunt's recipe." "Does anyone know what the difference is between mashed and smashed potatoes? You seem them both in restaurants sometimes. Are they the same thing?" "Maybe how violently they're prepared? 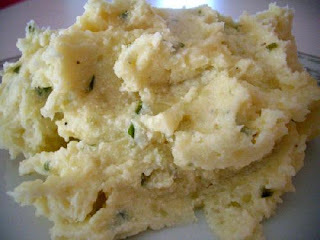 Smashed potatoes are prepared by throwing them at walls and hitting them with hammers?" "That seems unlikely. I always thought smashed potatoes seemed thicker, but I don't know why." "I looked it up once. They are generally thicker. The main difference is that smashed potatoes aren't whipped. Once you use an electric mixer you start to get more of a whipped feel to them and then they become mashed potatoes instead." "Maybe I should mix them by hand so they're smashed potatoes?" "It doesn't matter what's faster, you're not getting them until dinner time either way." "That's not a bet you want to take Billy." Will Billy manage to eat the potatoes right under Ann’s nose, or will Ann successfully defend the spuds until dinner? Will dinner turn out alright, or will Ann horribly burn everyone so that we’re vomiting all night? Who will be the first to fall to the tryptophan and take a nap? As the 6th Floor Turns? Are we on a carousel? You could've done better than that!